Nearly all of us have been there, especially during the holidays. It’s that breaking point where all you want is someone who will listen patiently as you explain your dilemma, hear the urgency in your voice, feel your frustration through the phone and solve your problem in a way that makes the call worthwhile in the first place. You want swift service from a confident, knowledgeable representative. That’s exactly what you’ll get when you call Pilot. Year round—not just during the holiday season—you’ll reach a customer service agent, every time. At night, on weekends and during holidays, a friendly voice every time. In fact, 99% of the time, your call will be answered within 25 seconds of contacting Pilot. Our team is prepared to answer the phone within the first three rings. No matter if we’re handling our daily average of 2,000 calls or 3,500 calls at peak times, you’ll be a priority. And you don’t have to worry about being bounced from person to person in order to get a resolution. Our agents are cross-trained in a way that empowers them to handle any customer need from start to finish. 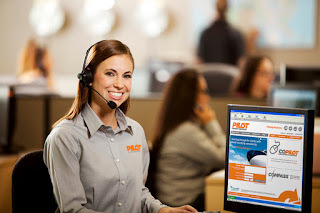 Reaching the right person at 1-800-HI-PILOT is how we prioritize customer service every day.